Lillian V. Truesdale, 86, of Bella Vista, Arkansas passed away Thursday, March 21, 2019. Lillian was born in Kansas City, Missouri on December 31, 1932. Lillian and her husband, Jim moved from North Kansas City, Missouri to Bella Vista in 1993. 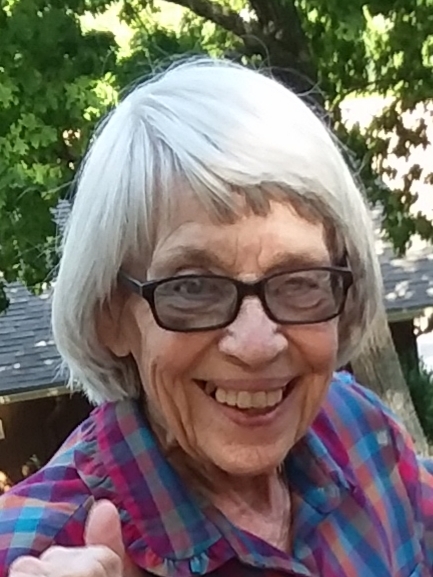 She was a member of the Church of the Good Shephard while in North Kansas City and of St. Theodore’s Episcopal Church in Bella Vista, Arkansas. Lillian was raised in Kansas City, Kansas and graduated from Wyandotte High School. She also attended Johnson Business College and Central Missouri State University. She was an active member of Delta Zeta Sorority while living in North Kansas City, in which she developed the volunteer system for Children’s Mercy Hospital for the Children’s Hearing Clinic. She was a Cub Scout Den Mother and leader. Lillian was active in the Church of the Good Shepard as part of the church support team in which she served for many years on the Alter Guild and worked as the secretary of the Reverend Herman Page. She also worked as an assistant secretary in the North Kansas City School District and later prepared taxes for H&R Block before retiring to Bella Vista. Lillian and Jim built their retirement house on Lake Loch Lomond where she enjoyed sitting on the porch taking in the scenery, bird watching, reading, visiting with friends and neighbors, playing Bridge, working crossword puzzles, cutting out recipes and cooking in her kitchen. She loved her Mice! She is survived by her husband of 65 years, Jim; son, James A. (Tony) and wife, Mary of Laramie, WY; and grandson, Christopher James (CJ) of Miles City, MT. She has followed the Light and now sits with Jesus Christ our Lord and all her friends, family and her beloved dog, Molly. A Memorial Services will be at 10:00AM,Thursday, March 28, 2019 at St. Theodore’s Episcopal Church in Bella Vista. Memorials may be made in memory of Lillian Truesdale to the Bella Vista Animal Shelter and St. Theodore’s Episcopal Church.